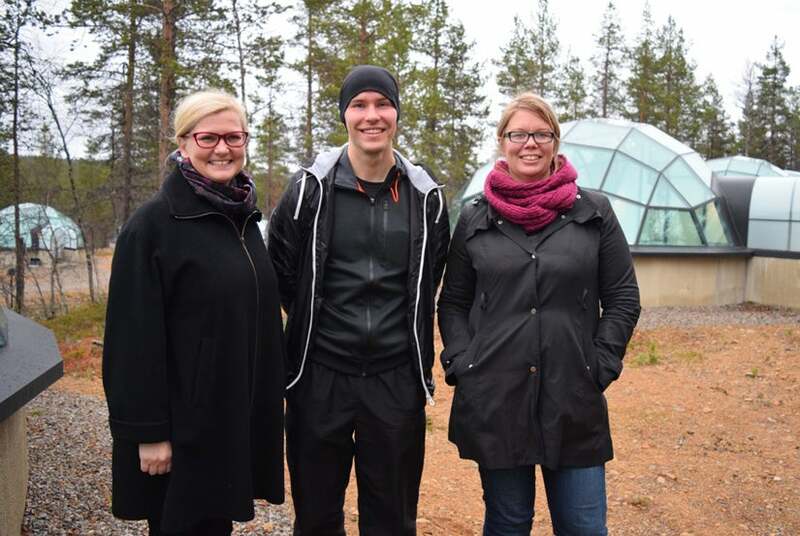 Tanja Ahven-Posio, the head of Finnish Lapland Film Commission, Jussi Hiltunen,a Finnish director and Kati Nuora from the Finnish Film Foundation are in front ofglass igloos at Kakslauttanen, where Ralph Lauren’s fall collection was shot. FINNISH LAPLAND – Only a couple of daily flights service Ivalo, the northernmost airport in Finland. It is obvious the municipal center of Inari, Finland’s largest and most sparsely populated municipality, is a quiet and laid-back place. There are more reindeers than people and we spot our first ones on our way from the airport to Siida, home to the Sámi Museum and Northern Lapland Nature Centre. Our bus driver slows down immediately and lets us take photos. 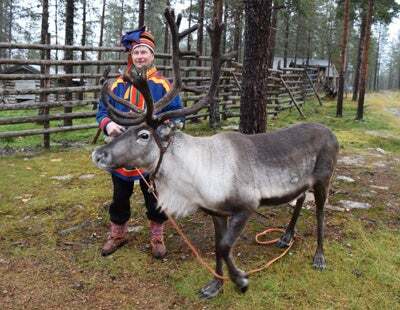 He knows visitors come to Lapland not only to relax, ski and hike but to see reindeer, Northern lights and the indigenous Sámi people that populate the region. Actress Renée Zellweger is the closest link between Hollywood and these people: her mother is of partial Sámi descent, from Norwegian Lapland. Sápmi – the area of northern arctic and sub-arctic regions Norway, Sweden, Finland and the Russian Kola Peninsula – have been inhabited at least 5,000 years; it is Europe’s most remote region, and yet even here movies live. Since 2002 the Skábmagovat Film Festival has been presenting Sámi films and TV shows at end of January, in the middle of the darkest and coldest winter when there is barely any daylight. One of their theaters, the Northern Lights Theater, is made of snow and the sky is the roof. A better-known film festival, the Midnight Sun Film Festival, held in June in Sodankylä, offers a completely different kind of atmosphere; the sun is shining 24/7 and screenings are running around the clock. The festival was founded by filmmakers Anssi Mänttäri, Aki Kaurismäki and Mika Kaurismäki together with Sodankylä municipality in 1986 and it has attracted directors like Philip Kaufman and Francis Ford Coppola. The Finnish Lapland Film Commission would welcome more Hollywood directors and especially productions to Lapland. “Finnish Lapland is a land of full extremes with a unique landscape. When it’s quiet, it’s dead silent. When it’s light, it is light for weeks and when it’s dark, it lasts for months,” the head of Finnish Lapland Film Commission Tanja Ahven-Posio told us when we met during the HFPA’s recent trip to Ivalo. Even though Lapland is among the world’s last wildernesses, things are still made easy for visitors. There is a modern infrastructure and many local business owners participate in Film Friendly courses. For example, Lapland Safaris, a local tourist expedition agency, has recently become proficient in servicing the special needs of film production companies and crews that visit the area. As locals, they know the best shooting locations in Finnish Lapland. Still, the film industry is still a small business in Finnish Lapland. “Last year six TV shows, six commercials, three movies, three documentaries and one short movie was shot here,” Ahven-Posio tells. Companies like Coca-Cola, Hyundai and Ralph Lauren have shot commercials here on the backdrop of the wondrous winter landscape. Indian Bollywood movie Shamitabh benefitted from an opposite phenomenon: the crew used the summer months’ midnight sun and shot the movie on their local time, three hours ahead of Finland. It helped them to communicate with the motherland. Finnish Lapland, like Finland as a whole, is facing a big challenge. It has to compete against other Nordic countries which are offering similar kinds of nature with incentives and tax benefits. “Finland is still working on that. We are working on a cash rebate model where production could get 20% back of the money they spent. At the moment Finnish Lapland Film Commission tries to find sponsors on a case-by-case basis,” Ahven-Posio says. Right now, like in the past, filmmakers from the North are moving South, to Finland’s capital Helsinki where work is more abundant. “Most production companies in Finland are located in the greater Helsinki area. Because of that many productions that take place in Lapland are shot with a crew from Helsinki. But in the last couple of years the film industry in Lapland has developed a lot. There are many professional production companies nowadays,” says Kati Nuora, the International Information Officer from the Finnish Film Foundation. Luckily the distance between Helsinki and Finnish Lapland by plane is little more than an hour. That makes it easy to hire a crew from Helsinki when needed. And not everybody has left. Miika Niemi’s Flatlight Creative House production company, based in Rovaniemi, as is director Jussi Hiltunen, who shot his short movies – All Hollow’s Week, The Legacy, Winterheart – in his native city. He will film his first feature length movie, an action western called Law of the Land, in Finland and Norway next Spring. “Exquisite lights, magnificent nature and friendly people make Lapland a unique place to shoot movies. It is an honor for me to be able to work in my hometown and surrounding areas. And of course I am happy, if my work makes Lapland more known,” Hiltunen told us. Local people made an impression with their warmth and English skills – everybody seems to speak English. But before the film industry in Finnish Lapland can hope to be as profitable as tourism and reindeer herding, it has to be motivated by incentives, like in other Nordic countries, Hungary, Malta and many other places where the film business in booming.